Gone are the days when recruiters used to use traditional methods of marketing, job ads. The traditional methods of recruiting include the distribution of pamphlets, newspaper job ads job portals and referrals. These days’ with Social Media dominating the way we connect with people it has improved the way recruiters look to hire talented individuals. As the heading clearly states; you need to start where the people flock, if you are to get anywhere in your Recruiting or Sourcing process. It is that simple, go to Social Media sites because that’s where your potential candidates are job hunting. It may sound obvious, but it isn’t. While you have several social networking sites available not all, serve you best. Sites like LinkedIn, Facebook and Twitter are preferable due to their large database including their features. But industry focused sites or blogs have a small database to choose from that comprise of specific field related audience. When building online connections for Recruiting; don’t forget your biggest asset, your current employees. It is important to note that internal recommendations are the best way to get reliable employees. Besides you can even request your employees to post job ads on their social network sites. Although it is preferable to have a lot of connections, it is also essential that you have quality connections. Put simply, having 500 connections is not as effective as having 50 connections that know you well and who would help you with your recruitment needs. LinkedIn is more than a networking site it is a dedicated business networking site. Its layout and display of information is in the resume style. This enables you to get a view of all the information at first glance. Besides, it even has the groups feature, which helps you to participate in the forum discussions. You also need to answer the posts on the forum if you have some information to contribute and help’s you to get recognised as well. The Recruitment Industry is constantly evolving and most Organisations are relying on modern techniques of Sourcing Candidates. While Organisations use referrals to a large extent more of them are now turning to Headhunting and Phone Sourcing methods of Talent Sourcing. 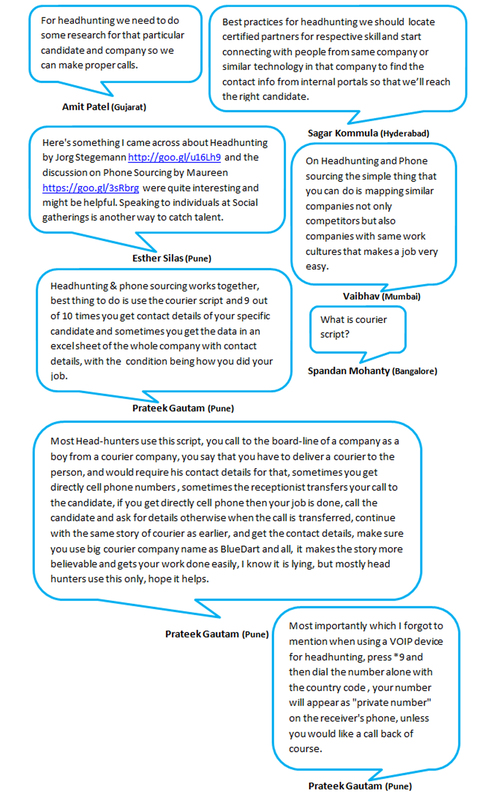 In view of this development in the Talent Acquisition Industry the next Hike Group Chat discussion addressed this very topic, “what are the best practices for Headhunting OR Phone Sourcing?” as suggested by Amit from the West Hike Group of Sourcing Adda. And here’s what we discovered………..
Based on the conversation above we can conclude that the Headhunting and Phone Sourcing methods that are a part of the modern techniques of Talent Sourcing are quite promising to fill positions. If you’d like to add to your learning then be sure to follow @SourcingAdda and be a part of Sourcing Adda and participate in more such activities to come as you can be assured that you will definitely add to your learning and will assist you in your quest to be the best Talent Acquisitionist there is. How to Use Pinterest for Recruiting? Most Recruiters and Sourcers use Social Media for Recruiting. The popular ones being LinkedIn, Facebook, Twitter and Google+ but are there others that can be used for Recruiting, if so what are they? If you haven’t already thought about this don’t fret because many Recruiters or Job Seekers alike haven’t either. The reasons why Recruiters and Sourcers might not have thought about such channels are plenty but to name a few, the popularity of these sites results in a huge pool of talented individuals to choose from, the fear of not achieving the desired results via channels that have not yet been explored, the mental block that these are the only sites where the chances of recruiting the right Candidates are higher due to the volume of users. Well, while that may be true it doesn’t really have to be just those sites. Specific sites like Pinterest that are devoted to creativity can serve a Recruiter well for specific Candidates. Pinterest being devoted to creativity is the perfect site for Recruiting Candidates for creative profiles for instance if one is searching for a Teacher or a Designer, Pinterest is a good site. Here too Recruiters can search for Candidates in a similar fashion like any other social networking site. The only drawback is direct contact with potential Candidates. But that doesn’t matter if you redirect it to sites like Facebook, Linked In or Twitter. If you thought Pinterest was good only for Recruiting Teachers or Designers, you are sadly mistaken. Because Pinterest functions along similar lines like any other popular Social Network, Pinterest too helps you to create a board for your company. Once created Recruiters can then post job specs on the company’s board. Although you can create boards based on your interests you can even attract individuals of similar interests to your board and thus build your connections as a recruiter. By creating such boards you can even share them on sites like Facebook and Twitter. Don’t just use images for Recruiting, use YouTube to pin multimedia. Apart from pinning images of team building activities on your company board you can add some videos of employees in action. This will promote the skill your company is looking for. And you are likely to attract individuals who share this similar trait thus speeding up your sourcing process. Not only can companies promote themselves via the board but they can also gain a perspective on the interests on possible Candidates. Apart from this companies can also look at what people have pinned and by this it gives them an idea of their interests. This helps them not only to develop their brand name but also gives them an insight in to what interests customers which in turn helps them to improve their products based on these findings. So are you going to grab this opportunity to explore new Social Media sites for Recruiting? Are you going to be the first to explore other channels that have not yet been explored to select Candidates? Besides its high time you added Pinterest to your Sourcing toolkit to boost your Recruiting and Sourcing needs. Hike Group Chat – Is Weightage given to Education or Relevant Skill Sets when hiring? There has been a long standing debate concerning the weightage given to education or relevant skill sets when hiring. In an attempt to come to some kind of conclusion Sourcing Adda decided to conduct the Wednesday’s discussion on, “Education OR Relevant Skill Sets, which one to be given more weight age while hiring a candidate & which one will benefit more?” at the Hike Group Chat member’s request Ankush from West. Looks like we had a lot of inputs this time and from this interaction we can conclude that while Education holds more weightage in comparison to Relevant Skill Sets yet to individuals displaying a passion and experience into the chosen profession the opportunities are unlimited. These Candidates too can gain entry into their field of choice. It’s great to know that job opportunities aren’t as limited as one would hope without the required education. This only goes to show that one can move into any profession of choice and expect opportunities to help them move ahead in the Career Ladder. To attend more such discussions follow @SourcingAdda. Hike Group Chat – How to attract Passive Talent? Attracting Passive Talent is simple enough with a readymade vast pool of connections available online. Making sure you attract these candidates isn’t that simple. This is because of a few changes to the Recruiter’s role today. They are now expected to possess Sales and Marketing skills clubbed together with Branding Skills all of this to scout candidates best suited for the role. Due to this development just being a Recruiter isn’t enough if you’re looking to attract Passive Talent that now makes up 75% of the workforce according to a LinkedIn Survey conducted with 18,000 users across 26 countries. Hence, we @SourcingAdda conducted our weekly Discussion on, “How to attract Passive Talent” upon the request of our Hike Group Chat member i.e. Sainath from South and here’s what was revealed… Apart from the ones already mentioned we also have some other ways by which you can capture Passive Talent such as posting new vacancies on a well-known site like Dice, the all-time favourite Referrals programs that till date have proved very effective, posting your Job Specs on countless sites that are Industry specific and cater to only those individuals, publishing articles that are either Industry specific or otherwise. Another way is by ensuring that your site is Mobile Savvy and let’s not forget Employer and Employee Branding that inculcates audience engagement to build Talent pipelines that you can count on to meet those growing KRAs. These are just some innovative ways to attract the right Talent. If you have something more to add please be sure to leave your comments and we’ll include them in our next post. In the meantime follow @SourcingAdda to stay updated with our ongoing activities and future events.